More detail on these transitions can be found on the blog post located here: http://sustainableengineeringsystems.com/2013/02/20/technology-transitions/ . The blog post also contains useful information regarding ways to assess the technologies and how to structure your reports. Using the above question as your initial guide, you will design and write your report in a manner that facilitates decision-making and subsequent action. Accordingly, when writing the technical report, you are to imagine that you are opening or beginning a conversation about the financial implications of the technology transition you selected and how those implications affect future action. Your reports are meant not only to demonstrate mastery of the concepts we’ve been learning in class but also to give you an opportunity to work on your writing. With that in mind, we have identified five qualities we are looking for in the technical reports that generally are signs or markers of an outstanding report. In each of these qualities, different conative strengths are represented, both in the process and in the result. 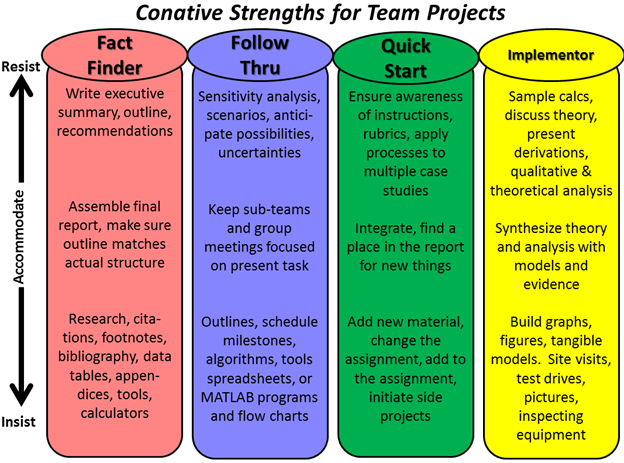 Some associated conative strengths are listed under each quality. Your team may not possess all of these strengths, but the tasks they are associated with are still expected to be done. Demonstrates knowledge of engineering economics. For example, you should demonstrate that you can make a cash flow diagram, calculate net present value, including sample calculations, and perform a sensitivity analysis. Communicates clearly and effectively in a concise but thorough and organized manner. Communication involves more than your writing style—it is also based on the way you present your arguments, data, and visuals. Put another way, the organization of your report and its overall visual appeal are just as important as the words you “write” in your reports. For example, graphs included in your report should not only have proper units, labels, title, legend, and use of color and/or contrast, but should also serve to illustrate (or argue) your point in a convincing way, without resorting to tricks involving scale or units. There is no page limit, but keep in mind that being concise yet thorough is one of the categories you will be graded on. Shows evidence that the writers are attuned – they understand the meaning behind what they are saying and the needs of their audience. Reports should show that the writers have done background investigation into the question being addressed. In addition, reports should show that writers understand both the complexity of the problems involved in making recommendations for action as well as an appreciation for how their audience may respond to the recommendations (positively or negatively). Enables action. This underscores the point that your report should make a definite recommendation for the situation(s) you have defined. Also, the arguments and calculations made throughout your report should be easy to understand or explained sufficiently so that the reader understands not just what recommendations you have made, but why you made them. Treats the rubric as more than a checklist and goes beyond the listed requirements. Here is where you can get points for something surprising or exceptional. Extra effort can be rewarded. Please note the above qualities do not have pre-determined weights assigned to them but instead will be based upon how well your teams demonstrate their understanding and application of them. For example, some teams may be more skilled in communication than facilitating decision making. For them, communication will be weighted more heavily than category facilitating decision making. “Technology Transitions” will be assigned Tuesday 2-4-2014. Submit your technical report by Wednesday 2-19-2014. Submit to CritViz by 11:59 PM on 2-19-2014. CritViz Peer Review will be due by Saturday 2-22-2014. Note: Submission via e-mail will not be accepted. Submit only through CritViz. If CritViz experiences technical difficulties during submission, upload to shared folder on Box.com, then continue attempting to upload to CritVIz. Each category will be scored out of 100% first. These scores will then be weighted in descending order from the highest to lowest score. The weights used are .3, .25, .2, .15, and .1. Weighted scores will then be added together to form your grade out of 100. An example is provided below. So, the dynamic weighting is set up to reward strengths of papers while still demonstrating where they need the most improvement. Weighting changes after revising papers as well. If the students for the example paper above greatly improved their engineering economics portion, but did not improve their actionable portion, then weighting might change to have engineering economics as .15 and actionable as .1. It is entirely based on the raw percentage grades which are scored first out of 100%, and then weighted. As a reminder, these reports are meant to be the start of a conversation. Therefore, you will be allowed to revise and resubmit. I expect to have reports returned to you by February 27th. Revisions must be submitted by March 6th. Graded revisions should be returned to you by March 18th. With student permission, outstanding reports will be uploaded to the ASU Digital Repository, where they will be accessible to the public. Incomplete executive summary. The executive summary should be a 1-2 page summary of your paper, including intro, problem, hypothesis, methods, results, discussion and conclusion. Too frequently what I receive is an introduction and problem statement, but nothing more. Missing references or citations and unsupported statements. If you make a claim that is not axiomatic or your original insight or contribution, it should be cited in text and a reference should be provided at the end of the paper in a bibliography. For example, if you say “Nuclear power is the greenest power” this is not self-evident, and you have not provided a reference to support it. Find an article or other reference describing why nuclear power is green, and add that to show support for your claim. Also, make sure to format your references properly. There is no required standardized format, but choose one and keep consistent. Make sure that it includes enough information so that a reader could find the reference on their own. Redundancy. Aside from ideas introduced in the executive summary, nowhere in the body of your paper should you repeat yourself. Lack of attunement. Some papers seem confused regarding the audience. Using a hypothetical audience and even identifying who the paper is intended for in the text can help with this problem. Figure out what would be important to them, and incorporate that into your analysis. Convoluted paragraphs. Typically, paragraphs should have one main idea and some supporting sentences. Multiple ideas per paragraph can make them confusing and disrupt the flow of reading. Graphs – labeling and scaling. ALWAYS label both axes in a graph with the numbers and units. Also, if part of your graph has a much higher value than the rest, consider using an axis break to make the graph easier to interpret. Make the report look professional. It’s OK to be creative, but use fonts and backgrounds that are aesthetically pleasing and not overly bold. If it’s not something you would expect a professional to deliver to you, then don’t deliver it to me. Spelling and grammar errors. There is no excuse for spelling or grammar errors that should be caught by running a simple spell check before submitting. This is automated feature of most word processors that can help catch errors and improve the professionalism of your report. Some errors are harder to catch using the automated system, but should still be avoided. Have multiple group members proofread the final document. Consider having a writing tutor review the document if you are having significant difficulties. Organization of the report. The structure and flow of the report matter – not just the content. There should be a logical flow to the report where one section naturally leads into the next, and the reader can follow the line of argument. For example, don’t present results before describing the methods used to get them. I have removed Anh Le from this team. He is free to pursue joining a new team for TechRep1. I’m looking forward to the results. Approved. OK. This ought to be interesting! (Approved). As of today, our Resistant QS team was approved. We shall carry on with a horizontal or vertical comparison of the Tesla S in the topic of “Electric vs. hybrid vs. natural gas vs. conventional cars”. Approved. My impression was that the team was most interested in the horizontal comparison? I think that makes it pretty obvious what topic we pick! is 6 5 4 6 enough for the position ? No. That’s not insistent QS. Could we throw in Electrodeless lamps in there as well. I’m a 7-2-8-3. What answer would you expect from me to your question? And anything else you want to add that brings more value to your report is good, too.